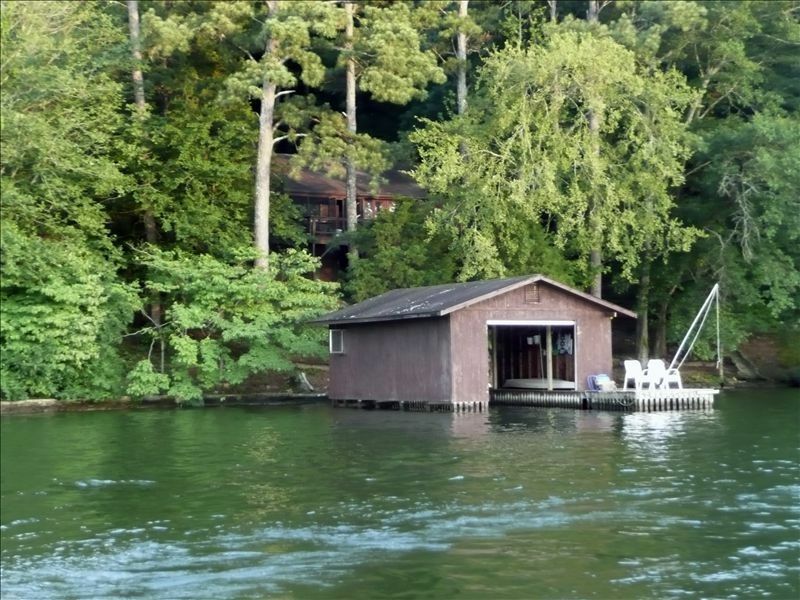 This cozy lake house sits on a extremely private wooded lot. Great fishing is just a few steps away at the dock and one slip private boathouse with a beautiful view of the sunset over the lake. Great water [15 feet deep] for swimming or fishing right off the dock. Play a game of horseshoes by the fire to wind down for the evening. The driveway is steep so it is best to launch your boat before arrival. The boat launch is conveniently located just across Highway 431-just a few minutes away from the boathouse. House ...nice hardwoods. All beds with quality mattresses and linens. Beautiful lake front views from all rooms with wide curtained windows. Main level includes living room with comfortable seating and flat screen TV, Fully equipped kitchen and separate breakfast or general dining area, master bedroom w/king bed and one bathroom. Downstairs also offers beautiful lake views from all rooms, a 2nd kitchen, a 2nd bath room. 2nd bedroom has 2 double beds and one single, great for sleeping kids. The 3rd bedroom is very private with a queen-sized bed, and its own window view of the lake; could function as a second master bedroom. Upper and lower porch and small screened in porch have a beautiful and slightly elevated view of the lake. Upper and lower deck with additional screened section on upper floor. Check in after 3:00pm Check out 10:00am Please note: The owner is not responsible for the guests' boats or other water crafts. The owner will consider pets. If the pet is approved, there is a nonrefundable pet fee of $100. One of the best locations on Guntersville Lake with very friendly neighbors. The pictures of the house pretty much let you know what you are getting and the a/c works great. I really enjoyed the outdoor aspects with the deck and the covered porch underneath. We had a great time. Cabin was great but dated. Family enjoyed the weekend greatly! View was perfect, kids had fun fishing from the boat dock. My sister and her husband came over by boat and spent some time with us. Perfect location for fishing, swimming and tubing. Would stay here again. Boat house was nice and beds were nice. Living room was super small and furniture uncomfortable. It was dated but adequate and on a beautiful lake. A great spot to get away from everything - quiet and secluded. Just big enough for 6 to 7 family/friends to meet at, where your not stepping on each other. We loved the indoor fireplace and the dock to fish from; this will be a holiday for our family to remember. Would recommend this location to others looking for the same! Thanks again! We enjoyed our time in Gunteraville lake but the house needs some work. The beds were uncomfortable and the house was not in great shape. But the town is great and the house is convenient.